Japan will get exclusive content for Killzone: Shadow Fall and the voice cast has been revealed. While most shooter fans are already playing Guerilla Games' debut effort, Killzone: Shadow Fall, on the PlayStation 4, the title has yet to make its debut in Japan. To make the wait a little sweeter, Sony has confirmed that the Japanese version of the game will have exclusive content such as "drone skins" and "collaborative content" exclusive to the country. Unfortunately, no further details have been shared regarding these exclusive items. In the same announcement, Sony Japan has also revealed the cast of actors who will dub the multiplayer of Killzone: Shadow Fall, and it's listed below. 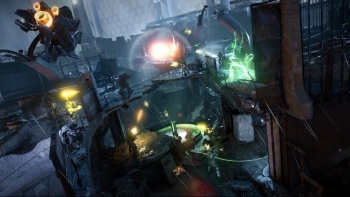 Published by Sony, Killzone: Shadow Fall was released in November of last year for North America, and will be released on February 22 in Japan. You can read The Escapist's review of Killzone: Shadow Fall where it was mentioned that while it won't win over new fans, it's still "a fine shooter with a fun story, and a multiplayer mode that fans can sink hours and hours into."